In 2015, lithium battery is one of the most talked-about subjects in industrial field, just behind the VR technology. When BMW and Volkswagen in Germany one after another invest 10 billion dollars on the development and research for lithium battery equipment, it means that the lithium battery manufacturers in China have ushered a major development and change. 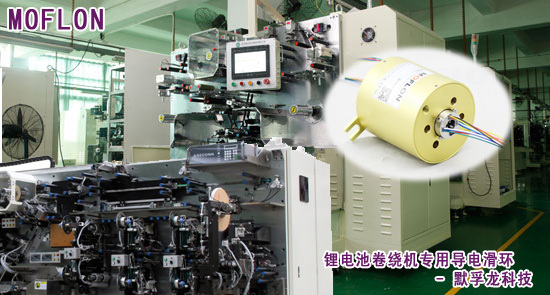 When senior management at MOFLON Company is aware of the great opportunity for the slip ring industry, they devote themselves to develop and test the specialized slip rings for aluminum battery equipment. Finally series specialized slip rings for aluminum battery equipment have been realized, which has filled the gap for MOFLON Company in this field. Aluminum battery equipment can be divided into many sub-industry and sub-equipment. slip rings are often utilized in square Semi-automatic winding machine, big square automatic winding machine, big cylinder automatic winding machine, the all-in-one square automatic winding machine, cylinder automatic winding machine, and aluminum battery raw material mixer. All of these equipments generally need to use two to four slip rings. MOFLON Technology Company is the inventor and technology leader of slip ring industry in China, who has been always focusing on providing high-performance slip ring solutions for global customers. MOFLON Company, specialized in designing and building customized slip ring, has provided innumerable high-level slip rings for all walks of life. Manager of MOFLON Accepting an Interview from Xinhua Net!